We've put together a real nice gift package for the gun owner, hunter, veteran and anyone interested in constitutional rights. The coin is a substantial 39mm diameter, brilliant uncirculated mint state .999 pure copper 1 0z round. 39 mm is approximately the same size as a U.S. silver dollar, so this is big. 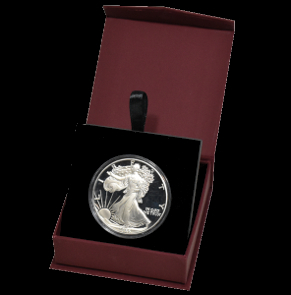 We package the coin in a clear acrylic holder, which is placed in a very nice presentation case that allows you to stand the coin up for display or, lay it down and close the case. The case has magnetic closures. The silver coin pictured in the case is not included. The picture of the coin is frankly terrible. This coin has a beautiful silk like finish with the forground in a frosted finish. The picture does not display the beauty of this item. Shipping is free. The price you see is the price delivered. If you are not completely pleased with your purchase, give us a call or drop us an email so we can expect your return. No hassle, no qualifying reasons. If you don't like it, return it in an unused, undamaged condition. This copper round is not legal tender.